If you have been subjecting your locks to years of abuse with heating and styling tools and overloading it with products to tame, you know deep down that it’s time to stop. But how else can you style your hair and tame it into submission? The answer lies in the old adage: less is more. Turns out, you don’t have to do much to get the hair you want. Give those styling tools a rest and let your hair dry naturally with minimal product can actually be more effective in unleashing your hair’s full potential. Perfecting your air-drying technique is what you need for a low-maintenance routine even for the thickest, wildest tresses. Hair becomes frizzy when your strands are dry and stripped of oil, andexposed to moisture in the air. 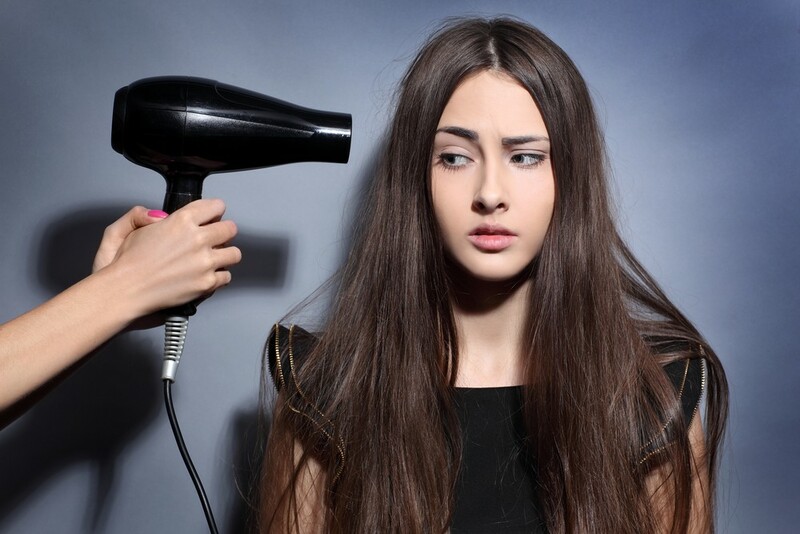 Shampooing worsens the problem by drying out your hair further. Shampoo is too harsh on hair, and sometimes not even necessary. Cut down your usage of shampoo to once or twice a week, and simply rinse your hair before applying conditioner to the ends. If forgoing the shampoo seems too drastic, try a cleansing conditioner that gently removes oil and grime while still hydrating your locks. After cleansing and massaging the scalp, leave the conditioner in for five minutes before gently rinsing it out. It’s best not to towel-dry your hair too much as that creates more frizz. Instead of roughing your hair up to remove the moisture quickly, try a gentler approach. Swap your old terry cloth for a microfibre towel as the tiny fabric particles are much gentler on the hair than cotton is. Be sure to dab and gently squeeze your locks, not rub them. Even if it’s just good ol’ coconut oil, nourishing your hair is vital for preventing frizz and getting some definition in your tresses. Apply some leave-in conditioner or styling cream onto damp hair and make sure the product is evenly coated for maximum results. One trick is to twist multiple sections of your hair after applying the product and then letting them dry. Then, gently run your hands through your hair and add a thicker styling cream to tame your tresses. You can also use a sea salt spray on top of leave-in conditioner to get a balance of texture and hydration. To get defined waves, you need nudge your wet hair in the right direction. Your hair dries in the shape you leave it in. So the more you twist your curls and shape your hair, the closer your are to your desired outcome. This means dabbing your hair dry and twisting your locks into spirals after working product into your hair. The tip of your hair is most prone to dryness and breakage, which results in frizz and limpness. To avoid this, apply some hydrating serum to damp hair to lock in moisture. If you brush your hair when it is almost dry or completely dry, you will experience frizziness. If you really need to untangle, do so with a wide-tooth comb while you are in the shower. Be sure to do it while your conditioner is setting, in order to avoid breakage. An extra dose of hydration never hurts, period. Everybody’s hair is different, so a product that works wonders for someone else might not work for you. So feel free to experiment with samples to find a lineup of products that work best for you. That said, you don’t have to completely rule out certain products just because you don’t like them. If your hair feels too heavy, apply less next time. Or apply a smaller amount at roots and more on ends. The key is to find the right balance that will give you the perfect locks you desire. Newer PostGet In Shape While Travelling on A Spa-fari Trip!